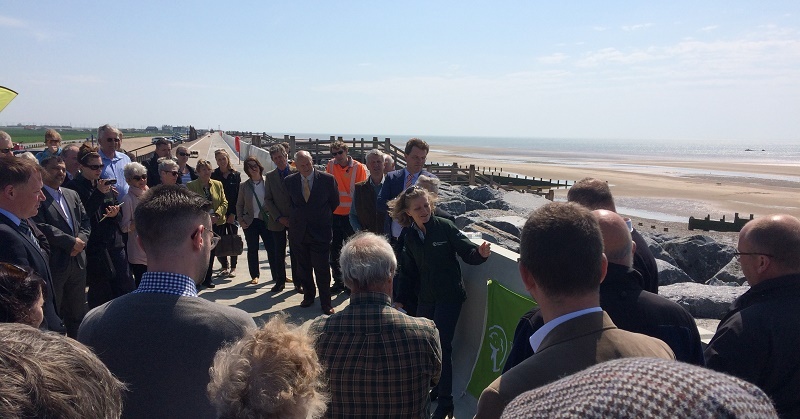 There was praise from all quarters last week at the opening of a coastal defence scheme delivered by Team Van Oord on behalf of the Environment Agency. The £30m Broomhill Sands Coastal Defence Project, which took two years to complete, will provide improved protection from flooding for around 1,400 homes and 100 businesses along a 2.5km stretch of the East Sussex coastline from The Suttons to Lydd Ranges. The scheme was officially opened on Friday 13 May by Emma Howard Boyd, Chair of the Environment Agency. In addition to representatives from the Environment Agency and Team Van Oord, other attendees included Damian Collins, MP for Folkestone and Hythe, representatives from the local community, the Ministry of Defence, Camber Parish Council, the Defend Our Coast Association and the Regional Flood and Coastal Committee. Ian Nunn, Environment Agency operations manager, told the Rye and Battle Observer: “Being here today, everybody is so positive about it. It’s not just a really good sea defence that will provide a fantastic level of protection, but it’s also a fantastic facility as well. The works at Broomhill Sands extend across 2.5km of beach and include: a 1.8km length of rock revetment requiring 265,000 tonne of rock armour and a new concrete wave wall; recharging 700m of shingle beach and replacing the existing timber groynes. The scheme also involved widening and improving the existing access way along the top of the sea defences, including pedestrian access steps and ramps down to the beach. Broomhill Sands is no stranger to success, having been cited in a string of industry awards schemes. This year it has been named a finalist in the 2016 Constructing Excellence Awards and the ICE South East England Engineering Excellence Awards 2016, which will be presented in June and July respectively. Earlier this year it received the Innovation Award at the 2016 Environment Agency Project Excellence Awards, and last year the scheme was the recipient of the Environment Agency Exemplar Award which is presented annually to recognise outstanding health, safety and environmental performance. Speaking at the official opening, Maurits den Broeder, chairman of Team Van Oord, said: “We set out to set to set new standards for making a large and complex construction project like this blend in with the environment, and to achieve maximum engagement with local community. “It is great to see what can be achieved through true collaboration between local residents, the Environment Agency and the contractor. “The residents have been very proactive in minimizing how the works have disrupted daily live in the area. Representatives from the Defend Our Coast Association visited our offices for regular updates and to discuss progress, as did the local kitesurfing community. “The project may be most visible for the amount of rock, shingle and concrete that went into it, but it should be remembered for the exceptional way in which everyone involved has worked together, the pragmatism of the local community, and the shared focus to get things done.